The carpet on your stairs see a lot of the foot traffic in your home because that is what stairs where created for a walkway to get you to the other levels in your home. The high traffic areas in your home require the most attention when it comes to carpet care. Here are some tips to help keep the carpet on your stairs looking fresh and to prevent traffic lane gray from appearing in your stairway. The best way to prevent a large accumulation of dirt and debris that causes traffic lane gray and even matting is regular proper vacuuming. Vacuuming stairs is not the most fun of household chores but it is well worth the extra effort. It is best to vacuum your stairs at least once every one to two weeks. Most of the dirt in your flooring is tracked in from outside on the souls of your shoes. The best way to keep the dirt out of the carpet on your stairs and any other carpet for that matter is to remove your shoes at the door. Not into going shoeless even in your own home? Don’t want to inconvenience your guests by asking them to remove their shoes? The use of a good quality welcome mat and a sign requesting all who enter to wipe their feet also helps. Just make sure to clean these mats on a regular basis or they will bring more trouble than help. Don’t forget to call in the pros at least once a year. A professional deep cleaning will get all of the dirt that has settled into the deepest parts of your carpeting that a vacuum cannot reach. 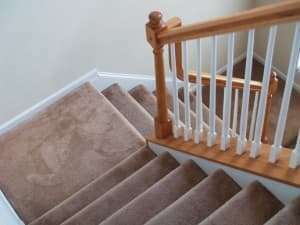 With the use of preventive maintenance and deep cleaning the life of the carpeting on your stairs will be much longer. For the best ecofriendly clean by experienced technicians in Seattle and Snohomish County look to All Kleen Carpet Cleaning..